Patrick Esson is the first Esson we know of in Logie Coldstone. He lived at Waulkmill, a long since demolished wool mill turned to farmhouse, just to the South East of Tarland. Records show he was taken to court on 26th June 1675, along with others by “poor John Davie” of Coull, who was pursuing payment for wood. The 1696 List of Pollable Persons included a number of Essons. The majority, by some way, were in Western and Central Aberdeenshire, around Cromar and Alford in particular. In Logie Coldstone they lived almost exclusively in an area surrounding Waulkmill, underlining the possibility these people were all related. One piece of indirect evidence for an Esson prior to 1700 comes from the Aberdeen Press and Journal of June 9th 1937. This included a photograph of very old farm house buildings with the caption. 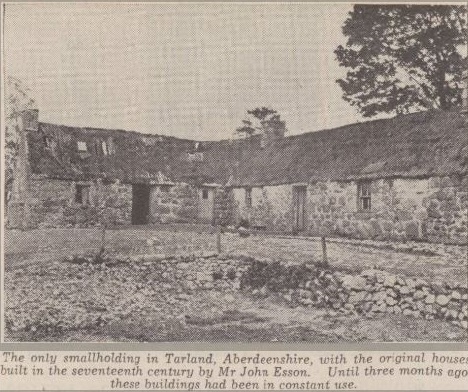 “The only smallholding in Tarland, Aberdeenshire, with the original houses built in the seventeenth century by Mr John Esson. Until three months ago these bulidings had been in constant use”. Nine generations of our Esson family line lived in Logie Coldstone from 1719 to 1971. The people we know of prior to 1700, above represented and earlier generation, although that is not assumed with certainty here as we do not know the links. Generations born after 1939 are not normally included by this website. We know that five of these generations lived at Millhead, or Milnhead as it was often called. . from 1719 up until 1874. Millhead is still a working farm on Melgum Road just outside Tarland, at the junction of Tarland Burn and Millhead Burn. There was a farmhouse there, at least one separate cottage, and bothy space for other workers. A dam above the farm on Millhead Burn was used to store and release water to drive the farm;water wheel. It would also have helped drive the larger mill at Newmill, a couple of hundred yards downstream too. Millhead 2015. Alex Blackhall stands in the doorway of what once was accommodation for farm workers. John Esson (ca. 1699 to 1765). John Esson is our first proven ancestor. We do not know his wife, but Church parish records show they had a son called Peter at Millhead in 1719. They moved at some point, to the Newton nearer Logie Coldstone village. We can see from legal documents and later birth records John had more sons, including Robert, Joseph, John and William. Parish records started in 1716, but there is a break from around 1720 to 1746 as they were destroyed by fire. A series of legal records from 1765 to 1799 helps us understand the family’s history at this time, however. Robert went on to marry Marjory Ross, and returned to Millhead where he continued to farm. It was he who continued our family line. He lived there until his death around 1800, an dagain his will of 1799 helps us understand the times. Robert’s brother John at the Newton still, married Euphame Gordon in 1746. This was just a few weeks after Culloden. William married Rachel Coutts and it seems likely moved to Dauch (Davoch). In 1765 John the elder died, and Joseph and William, still at the Newton were executors of his will. They were pursued for late rent by Alex Bowman of Aberdeen. These were far from straightforward times. Amongst other things, farming methods were relatively primitive at the time, and farming was vulnerable to poor growing seasons, which were more common in those years. From 1789 to 1791 a series of further court actions took place, claiming rent by Joseph at the Newton, and likely his brothers and cousins at nearby farms. This must have represented a harrowing time, leading ultimately to eviction for Joseph first from the Newton and then from Prony. As already mentioned, the correspondence, of these court actions give us useful information. Notably they confirm Robert of Millhead was indeed Joseph’s brother. Robert Esson seems not to have been troubled by debt in the same way Joseph was. We can only speculate why that was. Parish records of 1750 show a Robert Esson was commissioned to make benches for Coldstone church. Perhaps Robert supplemented his income by other work including building. Robert married Marjory Ross, thought to be of Bogstone Strathdon around 1747. A flat stone in Tarland Churchyard gave a lot of very useful information many years ago, although it is now so eroded, it is now practically illegible. Robert, his eldest son married Jean Reid of Towie and went to farm at Balnacraig in Aboyne. Margaret married William Reid, a writer or legal clerk, and they lived at Windseye. William, Robert’s second son, went to Marischal College of Aberdeen University. That in itself suggests Robert was not struggling for money in the same way Joseph was, even if William won a scholarship as he most likely would have done. On his return from university William had an illegitimate child, John, while at Millhead, but then married and moved to Melgum. His will suggests he was a successful wine merchant, as well as a farmer. John, the couple’s third son, married Janet Strachan and moved to Daugh, where his Uncle Peter, son of John, and his Aunt Rachel had been living. Alexander stayed on to farm at Millhead. Alexander was Robert’s youngest son. He took over the farm at Millhead and married Christian Anderson in 1797. Christian was one of the probably 9 illegitimate children of Alexander Anderson, the 9th Laird of Candacraig. Christian’s half-sister Helen Anderson, Christian’s half-sister, said to be the daughter of Isobel Ross, was another illegitimate child. Helen lived at Waulkmill. In 1812 Alexander, Christian’s husband signed a lease for 19 years for Millhead from Farquharson of Invercauld. He was leased the land for an annual rent of £66 plus 20 bolls good oatmeal, and 4 bolls 1 firlot of English coal, to be carried by him to Invercauld or any place above Culblean. The coal to weigh 36 stones (or failing the coal 5 shillings a year as the proprietor chose). Rent was to be paid at Martinmas. Despite Alexander Anderson’s undoubted faults he was generous towards Christian and children. Based on the content of his will, he had obviously loaned Christian and Alexander money, and goods before his death, which he “forgave”. On his death in 1817, he also left £500 to Alexander, £100 to Christian and £100, plus “such extra as was necessary” to Alexander, the couple’s eldest child to help him get through university. Alexander who was born in 1833 was Alexander and Christian’s first son. With help from his legacy he went to King’s college, Aberdeen and trained to be a doctor. Surrounding all these people, that is Anderson of Candacraig, Alexander and Christian, their eldest son, Alexander and his own child, also named Alexander, a substantial and sprawling tale unfolded, leading in one case to a death in the Army in India, and in another to a large dynasty of Essons in Oregon USA. That story is told here. Robert and Isobel were the next of Alexander and Christian’s children. They were twins born in 1800. Both had illegitimate children. One of Robert’s present day descendants of the same line of Essons is Charles Esson of Collieston, and David Bowen in Canada, Both carried out considerable research into family history. Robert Bowen described how one branch of their family like moved to New Zealand. Alexander and Christian went on to have children, Helen, Margaret, Charles, Christian and John. It was John, born in 1803, who took on Millhead next. John married Mary Forbes of Upper Ruthven in 1833 and they had seven children, Alexander, Elspet, John, Isobel, Christian Henry, Charles and Helen. John and Mary farmed at Millhead until 1874. John also had a child by Margaret Forbes, Mary’s sister, in 1837. This was an event which somewhat scandalised the parish and drew considerable criticism for two people, with somewhat question as to the circumstances and appropriate blame. The Parish treated it pragmatically however, although it was some years before the two were accepted fully into the church congregation. Eliza, as the child was named when to live at Waulkmill with Helen Anderson, who took in more than one child in need of care. Despite the upset this must have caused all the family, John and Mary stayed together, Margaret went on to marry and have children, as did Eliza. 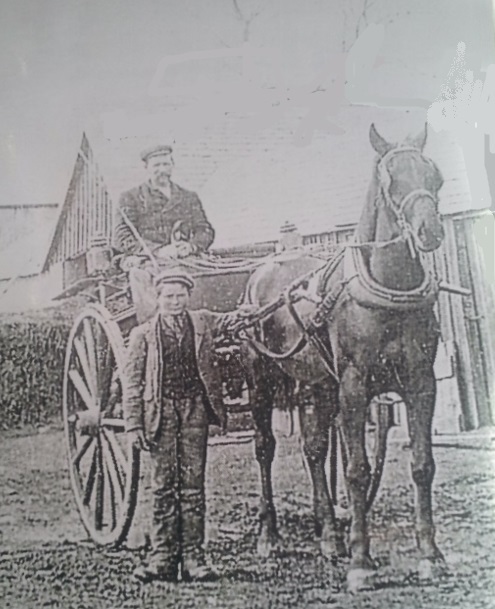 John continued to farm at Millhead, but when he was 71 in 1874, the family gave up the lease at Millhead and he, Mary and Charles moved to Aberdeen to run the Castle Inn wine shop at 9 Castle Square Aberdeen, now called Portals bar. The opportunity to run the wine shop and bar no doubt arose because of family involvement in the wine trade. It seems this move could have come about because John was suffering with ill health at this stage, as he died only two years later. Alexander, John’s eldest child, lived at Millhead, where he was recorded as a ploughman in the 1871 census. He married Margaret Gauld in 1862. Margaret was born at Wester Leochel, Leochel Cushnie in 1838. She was living at Nether Corrachrie when she married. The couple moved to Netherton, close to Millhead where they had two children, Margaret and Elizabeth. The family then moved back to work at Millhead, where John Hendry and William were born. After that. They moved to Millhead Croft, again a short distance from Millhead, where Alexander lived until he passed away aged 81 in 1915, and Margaret, aged 87 in 1925. William, Alexander and Margaret’s youngest child married Margaret Isabella Low on 14th January 1898. She came from her family home at Old Kinord, a house now in ruins, which still nevertheless suggests an impressive form, and in a splendid place. Margaret’s family history is shown here. The couple had seven children, Mary, George, William, Margaret, John, Edward and Alexander. Margaret Henderson Morrison was born in Turriff, North East Aberdeenshire, her family line is shown here. She applied for work, at Blelack House in Logie Coldstone, bargaining somewhat over her pay in correspondence we have and arranging to be picked up at Dinnet railway station on the now decommissioned Deeside line. Alexander Esson, the son of William was born at Knocksoul in 1899. Like William he worked at a number of farms in the area, again at the Leys in Tarland, and then close to Knocksoul at the Parks. He married Margaret Morrison at Forgue, when he was first horseman at the Parks, and she was working at Blelack as a maid. They lived at Parks Cottage, also called locally Monyfrink, a derivation of Moine Chruinn, a gaelic name meaning round moss, it is said. At Parks cottage Margaret, Alexander (Sandy), and Charlotte (Lott) were born. The family moved to the Mosstown, which was owned by Gavin Strang of Blelack in May 1929. That was just two days before their son Robert, Bob was born. The first feeing market of the year was held in May at Tarland, so it seems understandable that Alexander would move jobs at this time. When the family moved into the Mosstown, a Mrs Coutts was there still who had just has a baby. So for a time there were two babies of the same age in the house. The window was broken so it was likely cold at times, even if it was in May. William, Bill, the youngest was born in 1929. Alexander worked at Blelack where he was grieve or foreman for the farm for 42 years until 1971. When he retired he and Margaret lived at their own house, the Old Schoolhouse in Logie Coldstone, just on the other side of the woods. He continued to do odd jobs for Strang and others long after he had retired. They stayed at the Mosstown until they moved to their own house, the Old School House, Logie Coldstone on 25.10.1971. In all they had children Alexander (Sandy), Margaret, Charlotte, Robert and William. Margaret Esson could remember living at Parks Cottage when she was 90, even though she had left there when only three. Lott Ritchie wrote about her memories of life as a child at the Mosstown.